In the previous 6 years since Windows 7 made its appearance, it’s already helped bury some of the bad will generated by its immediate and underloved predecessor, Windows Vista. We were a little bit skeptical at first about whether it was worth buying, but we’ve really come to appreciate its features, from increased speed to DirectX 11 support, as well as its overall attractiveness and ease of use. Of course that doesn’t mean it can’t be improved a bit more in certain areas. Sure, keyboard and mouse shortcuts are nice, but you can only get more thorough personalization—like changing the look of the login screen, the Taskbar, or even Internet Explorer 8′s title bar—by digging deeper—into the Registry. Changing the wallpaper on your desktop is one of the easiest things to do in Windows. But if you can have that display any image you want, why not do the same with your logon screen? 2. Find the “OEMBackground” key; or right-click in the right pane and select “New,” then “DWORD (32-bit) Value” to create it (and then give it that name). 3. Double-click on “OEMBackground” to open it. 4. Change the value in the “Value data” field to 1. 6. Using Windows Explorer, navigate to your Windows directory, then System32oobe. If there’s a folder in here called “info,” go into it; if there’s a folder inside of that one called “backgrounds,” go into that. If neither exists, you’ll need to create them both first. 7. Copy the image (it must be a JPEG, and smaller than 256KB in size) you want to use as your logon screen background into the info background folder. The next time you restart your computer or log out, you’ll see this image as the new logon screen. If you chose an image that prevents the buttons and text from looking their best on the logon screen, you can adjust their appearance as well. CurrentVersionAuthenticationLogonUI (you’re not going into Background this time). 3. Change its value to either 1 (darker text shadows and lighter buttons, intended for lighter backgrounds) or 2 (no text shadows and opaque buttons, for darker backgrounds); 0 is the Windows default. If you use Internet Explorer 8 in Windows 7, you’re probably familiar with the browser’s title bar, which appends “Windows Internet Explorer” to the end of every page name. Why not change it to something a little more… you? 1. Navigate to HKEY_CURRENT_USERSoftwareMicrosoftInternet ExplorerMain. 3. Name the string value you just created “Window Title” (space included). 4. Double-click on Window Title. 5. Type your personalized title in the “Value data” field. Implemented as an easier way to arrange windows on your desktop, Aero Snap will automatically maximize a window if you drag it to the top of the screen, or resize a window to use exactly half your display’s width if you drag it all the way to the left or the right. If you don’t find this feature convenient, you can disable it. 1. Navigate to HKEY_CURRENT_USERControl PanelDesktop. 2. Scroll down to “WindowArrangementActive” in the right-hand pane, and double-click it to open it. 3. Change the number in the “Value data” field from 1 (Aero Snap is enabled) to 0. By default, the Taskbar groups together multiple windows of a single app, then displays all of them as thumbnails when you click on the program’s Taskbar icon. If you think it would be more handy to have Windows automatically open the last window when you click the icon, you can make that happen. 4. Double-click on LastActiveClick to open it. 5. Change the value in the “Value data” field to 1. 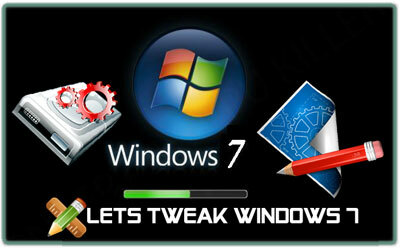 Windows 7 is set up to always combine Taskbar buttons from the same program and never display their labels. If, however, you’ve changed the setting to either not combine the windows at all or to only combine them when the Taskbar is full, you can change the icons’ width to hide the labels there, too. Here’s how. 2. Scroll to find the “MinWidth” entry. If it’s not there, you’ll have to create it yourself. 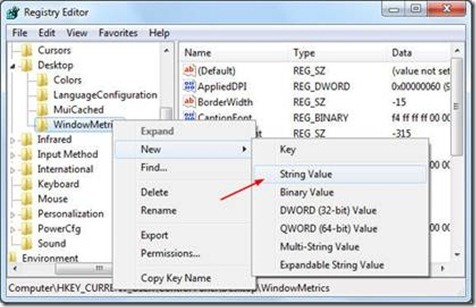 Right-click in the right pane, select New, then Select “String Value,” and name the object MinWidth. 3. Double-click MinWidth to open it. 4. Change the number in the “Value Data” field the width you want to allot to the icons. With the default small buttons, 38 is sufficient; with the larger icons, you’ll want about 52. Among the cooler features in Windows 7 are Taskbar previews, which appear when you hover the mouse cursor over the Taskbar icon of a currently running program. But when you do this, the preview doesn’t appear immediately. Luckily, it’s easy to speed it up (r, for whatever reason, slow it down. 4. 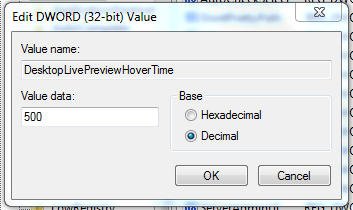 Double click on ExtendedUIHoverTime to open it. 6. Click “OK” to commit the change. When you hover the mouse cursor over one of the previews, all your other windows will disappear and show just that window. There’s a delay associated with this, too. To change this, add a new DWORD in the same location called “ThumbnailLivePreviewHoverTime,” and edit it the same way as above, setting its value to whatever you want (in ms). Aero Peek is Windows 7′s sleeker replacement for the old Show Desktop button. Just move your mouse cursor over the icon at the right end of the Taskbar to turn all your Windows invisible. But this, too, has a delay time associated with it, so if you find yourself accidentally activating it too often, you may want to increase the delay time. Here’s how. 4. Double click on DesktopLivePreviewHoverTime to open it. Leave a comment below and I will solve your doubt!